While being a game designer often requires hard work, long hours, and plenty of creativity, there are also plenty of advantages. After all, there’s a reason why the position of video game designer is one that most aspiring game developers dream of finding themselves in someday. 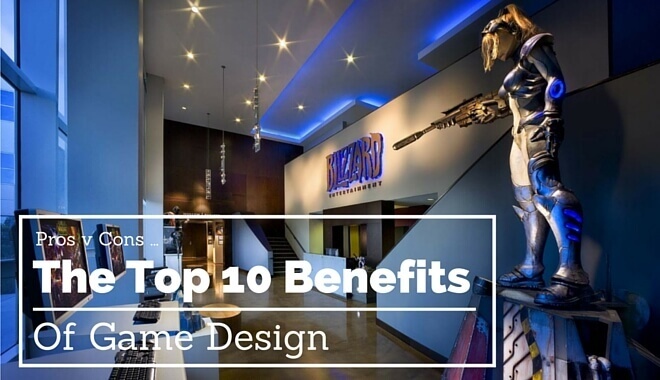 If you’re considering a career in game design, here are our 10 favorite video game designer benefits. It’s no secret that the gaming industry is getting more and more competitive. Thousands of college students graduate each year, which means even more people who will apply to the same positions you do. The truth is, not everyone lands a job right away at the game studio of their dreams. But the great thing about being a game designer is that you can do what countless others have done: make your own games. The indie scene has been exploding for years now, which means big opportunities for designers to create their own projects or join a small team of fellow indie developers. It may not be the most financially stable route to take but unlike most other graduates struggling today, at least you’ll be staying afloat and gaining experience doing what you actually want to. A game designer is someone who designs projects to make people happy. The average game designer with years of experience will tell you that if you can’t come up with ideas to make a game fun, you don’t have what it takes to be a designer. But while it’s true that the goal of the game designer is to entertain, these days there is so much more that a game can do for people. Video game are also being used to train soldiers, help children learn in school, and even help astronauts prepare for space missions. It’s nice knowing that games, which were once seen as only for children by most people, are now being used to improve our world and assist individuals in overcoming a challenge. It’s hard to believe that after North American video game crash of 1983, thousands of developers lost their jobs and almost every store refused to sell anything related to games. Then along came a Japanese company named Nintendo to rekindle the fire with their Nintendo Entertainment System coupled with Super Mario Bros.
Now fast forward to today and you’re looking at a powerful industry that rivals even that of Hollywood and television. This means that you don’t have to worry about switching fields or learning something else any time soon. With more people playing games than ever before thanks to Facebook and smartphones, the number gamers is only going to keep going up. All those gamers are going to need passionate designers to create awesome experiences for them. It’s a sad fact, especially in today’s economy, but most people are not doing what they dreamed about doing while growing up. Even college graduates are taking up jobs that had nothing to do with what they studies to try and pay their massive loan debt. If you enjoy the idea of creating characters, worlds, and gameplay for people to enjoy, then being lucky enough to land the role of game designers somewhere means you’ll be doing what you love for a living. The good news is that the pay and benefits for designers at most studios is pretty good, and even great depending on where you work, your experience, etc. Of course, most would advise against jumping into the gaming industry simply for the money. Instead, most development studios are filled with people who simply had a desire to use their own creativity toward making games for others. Although most game designers did go to college or university in order to receive instruction and learn new tools, it isn’t required. Aside from going indie and making your own games, a lot of developers are more than willing to hire a designer if they simply show that they are capable of making games. That being said, there’s no better way to learn the ins and outs of being a game designer than by going through a good program. Most schools have great courses that teach you how to use software, give you hands-on learning, and even help you make your first game before you graduate. Also, having a game design degree (or something similar) will usually increase your chances of getting your application looked at when you shoot your resume at a game company. The biggest mistake you can make is to show up to an interview for a game design position dressed in a full suit. This will immediately give the people at the company the impression that you’re very unfamiliar with game development culture, which is much different than most other work settings. This is because most game studios want to offer their creative minds a pleasant and relaxing workplace that is free of the stresses common in a conservative environment. While this doesn’t mean you can show up in your underwear to work, it’s great knowing you’ll have what most people say they value the most when looking for a job: a casual, fun work environment. If there’s one thing you can expect to have challenged as a game designer, it’s your creativity. That is because the designer is the idea machine of the team, which means others are counting on you to come up with exciting, unique concepts for artists and programmers to bring to life. Of course, they’ll be expecting good ideas and not whatever pops into your head first. You’ll definitely be tapping into your creativity when decisions need to be made concerning sudden changes, or when a mechanic needs to be tweaked or removed entirely. A game designer is often seen as the problem solver because they must come up with good ways to work around necessary changes while keeping the core of the game intact and fun. Any game designer who says they never brag about their job is probably lying through their teeth. There are few things cooler than being able to say that you make games for a living, especially when today almost everyone plays games either on PC, consoles, or their smartphones. There’s nothing more satisfying than hearing people talk about your game and mentioning that you actually helped make it. You’ll also get respect from fellow game developers since they know more than anyone the responsibility that comes with being a designer. Programmers, artists, writers, and other people involved in the development process certainly have important roles, but there’s just something about the title of “Game Designer” that just feels right to someone who grew up playing games. One of the perks of being a game designer is the opportunity to spend a lot of time getting paid to play games. This usually involves the game you’re actually designing to find bugs, test new gameplay mechanics, and see how it feels. And if you’re working on a big title at a notable studio, you’ll often be the first to check out other areas of the game you’re not working on such as the multiplayer. Aside from the games you’ll be working on, you also get to play other titles for the purpose of studying and analyzing them. You’d be surprised by how many designers gained inspiration for their own unique ideas while playing another company’s successful title. Checking out other games to see what works and what doesn’t is one of the most useful tools to a game designer. Being a game designer means working with other people who also grew up with games and love them enough that they want to help make them for a living. Since the game development process is very reliant on teamwork and cooperation, you’ll most likely have a good time getting to know other passionate gamers while working together to make a great game. The best part about working at a game studio is that everyone has their own unique tastes when it comes to games. You may have grown up and gone to college with friends who are all about a specific game genre, but now you’re enjoying hearing other people talk about why they love other types of games so much. It’s also satisfying knowing that as a designer you have a team of people having a good time while helping to make our ideas into a reality.